Brandon University is celebrating its 50th anniversary with a special beer, custom-brewed in collaboration with BU alumnus Mark Borowski. A golden ale is the perfect way to toast a golden anniversary. Brandon University has teamed up with award-winning Nonsuch Brewing Co. to create a custom-crafted brew in honour of BU’s 50th anniversary, and bottles of the limited-edition beer will be on shelves in Brandon this week. The BU50 Anniversary Ale pours a golden hue, with fruit and fresh bread aromas that enhance its crisp malt flavours. It is ever-so-slightly bitter, at 24 IBU, and is presented in a 750 mL bottle that is sealed with a Champagne-style cork and cage. It retails for $19.68 in honour of the anniversary year, and a portion of the proceeds will go to the BU Foundation. The beer also reunites BU with alumnus Mark Borowski, head brewer at Nonsuch, who earlier this month brought home a pair of silver medals from the 2018 Canadian Brewing Awards. 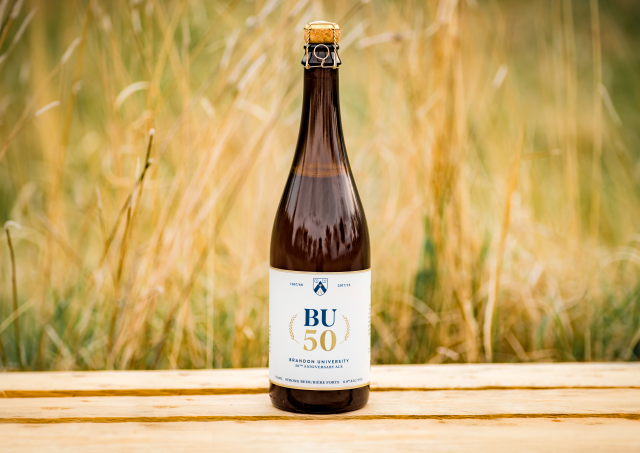 An extremely limited number of bottles of the BU50 Anniversary Ale will be on shelves this week — only at Brandon Liquor Marts. A second batch is already brewing, and additional batches will continue to be brewed through the summer and early fall. Supply will be expanded to Brandon beer vendors, other Westman locations and Winnipeg depending on demand. Beer aficionados will take note that the recipe is inspired by a Marzen, a German festival beer that is traditionally served at Oktoberfest. The unique BU50 Anniversary Ale uses a hybrid yeast to brings out more crispness, and further enhanced by the use of Saaz hops. The result is a refreshing and well-balanced strong beer that comes in at 6.8% ABV — intentionally chosen as a nod to 1968, the year the first graduates of Brandon University received their degrees. Previously, graduates from Brandon College received degrees from other institutions. To mark the 50th anniversary of BU receiving its charter, Brandon University has been celebrating BU50 throughout 2017–18. This yearlong celebration will culminate at an expanded 2018 Homecoming, this October 11–14, where all alumni and friends of Brandon College and Brandon University are welcomed back for a huge reunion weekend and community birthday part. Plans are well underway for the event, and registration will start soon at BrandonU.ca/Homecoming. The final batch of BU50 Anniversary Ale is expected to hit shelves for Homecoming.